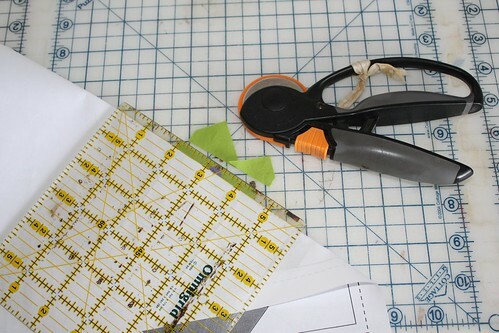 Now that you’ve got your foundations printed and your fabrics cut, or at least piled nearby, it’s time to start sewing. Take a look at the foundation. The center block is labeled #1. 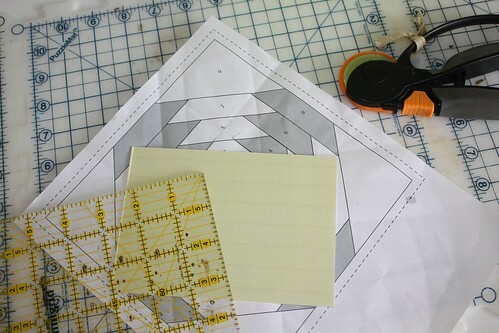 The next round, shaded triangles, is labeled #2 — and that number applies to all the pieces (or logs) in that round. Round #3 is white logs, and so it continues. You will work each round before continuing on to the next one. Place the 2″ (or thereabouts) square of fabric you’ve chosen for your center, face UP, on the un-printed side of the foundation. 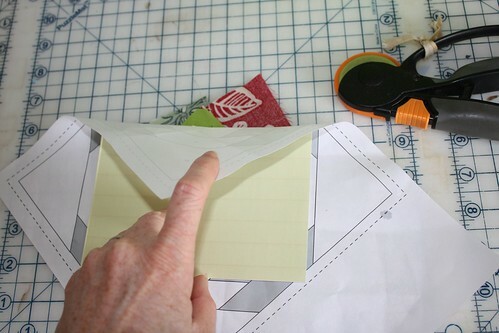 Hold the paper and fabric up to the light to make sure that your fabric extends at least 1/4″ beyond the edges of the printed square (these are your seam allowances). I find it helpful to secure the fabric in place with a dab of glue from a glue stick. 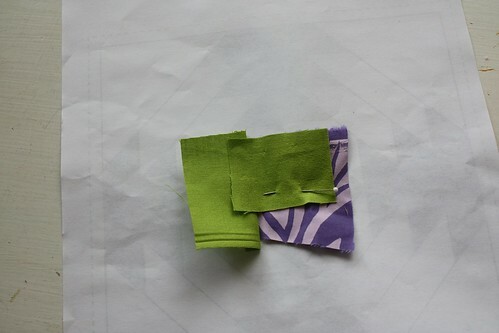 Now, take your secondary fabric that you already cut into 1.5″ strips (the solid green in my example) and cut a log a tad longer than the base of the triangle. Place this, face DOWN (some solids don’t have a right or wrong side, and in that case it doesn’t matter which side is down) along one side of your center square. Pin this in place if you’d like. 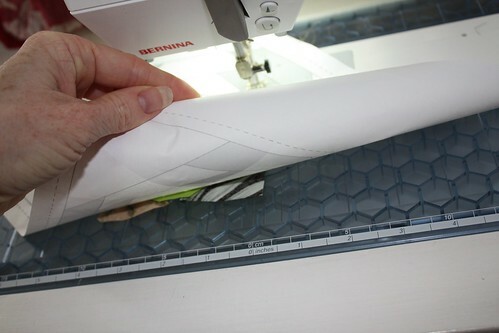 Set the stitch length on your machine to shorter than normal. Small stitches will both perforate the foundation paper, making it easier to rip off later, and makes the stitches sturdier to hold up to the ripping. 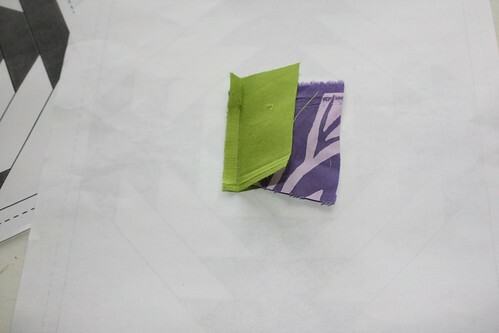 Now flip your foundation paper over and sew along the printed line of the side of the square on which you placed your second piece of fabric. Start a little before the beginning of the line and end a few stitches after it ends. 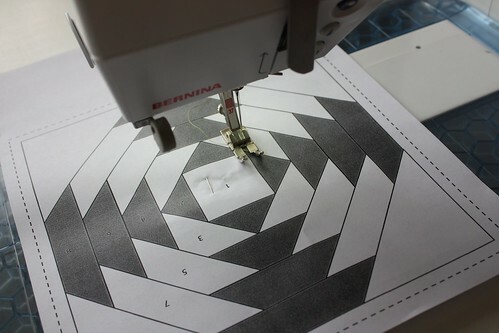 Remove your project from the sewing machine. Finger press your secondary fabric open so it now covers the shaded shape. Once you’ve finished a round, I like to go to the ironing board and press the fabrics with a dry iron to make sure everything is in place. Now place your foundation fabric side down on a cutting mat. 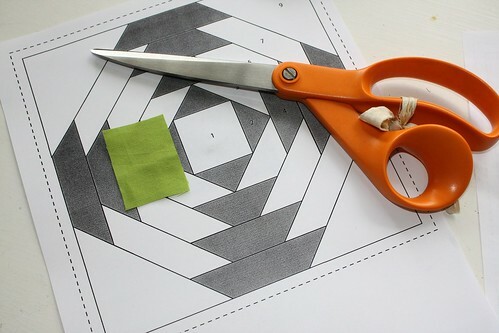 Place the straight edge of a stiff piece of paper, like a postcard, along one of the lines between round #2 and round #3 (between the shaded triangles, and the white logs). 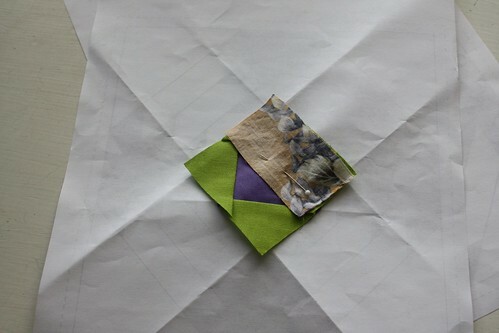 Fold back the foundation paper, exposing the fabric below. 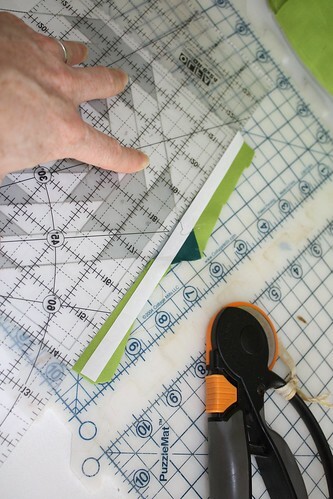 Place a rotary ruler 1/4″ over the folded edge and cut off any fabric that extends beyond that 1/4″ seam allowance. This sets up a perfect edge for you to place the fabrics in the next round! Rotate your foundation and fold back on the next line that is also between rounds #2 and #3 (use the postcard to make the folding easier). 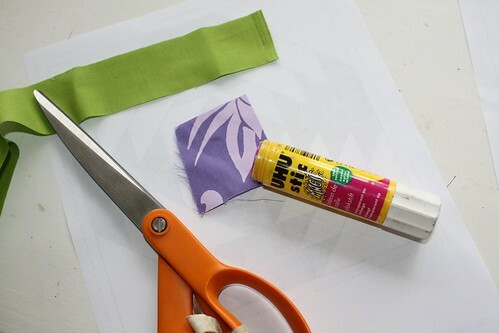 Place your ruler 1/4″ over the folded edge and cut off any excess fabric. Do the same to the remaining two sides. Now you are ready for round three. 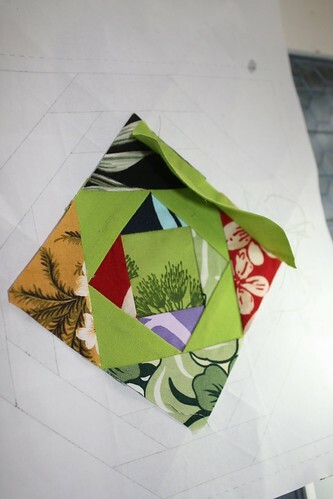 Place a piece of your primary fabric (scrappy aloha prints in my example above) face DOWN along one of the edges you just trimmed. You can rotary cut your fabric beforehand to 1.5″ by a little longer than the longest side of the #3 white logs, or just snip a scrap that’s about the right size. 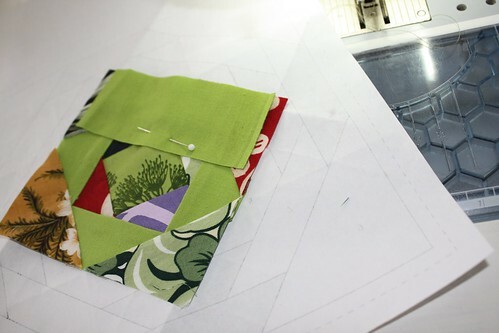 Flip the foundation over and sew along the line between round #2 and round #3. Remove from the sewing machine and press open the fabrics. Continue the round in the same manner. 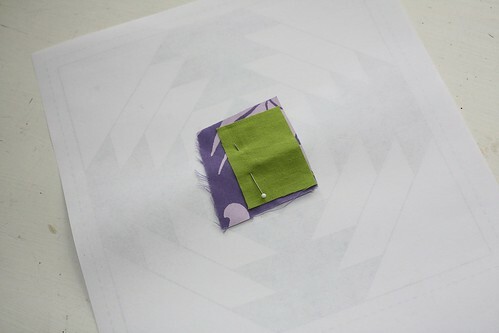 When you’ve finished the round, press it with an iron and place your foundation fabric side down on the cutting mat. This time, fold along the printed line between round #3 and round #4. This will be across the corners of round #3, not parallel to the logs you’ve just sewn. 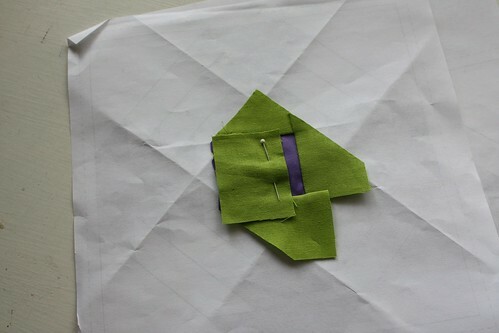 Cut off excess fabric (leaving the 1/4″ seam allowance) as with the previous round. After trimming all four sides, it’s time to sew on the next round, which is the secondary fabric. The logs in this round will not meet each other at the corners. That’s OK because the next round will cover those corners. 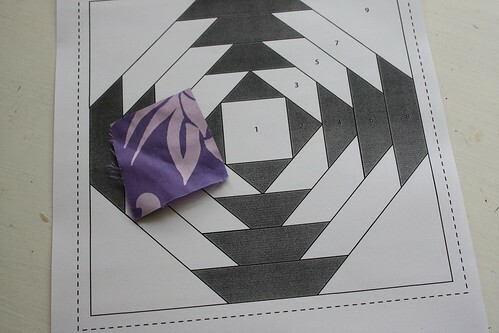 Continue sewing, flipping, pressing and trimming in alternating rounds of solid and scrappy fabric until you get to the eighth (shaded) round. Make sure that your fabrics extend at least to the dashed line (seam allowance) on this round. The ninth round are those big corner triangles of your dominant fabric. 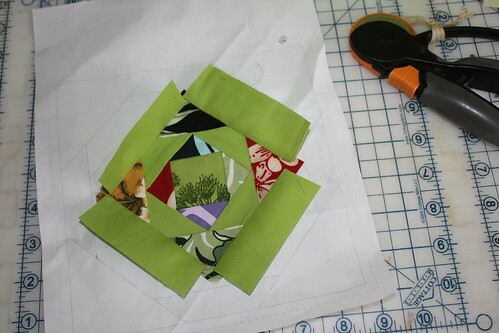 This is a great place to use those odd shaped scraps; just make sure that they too extend at least to the dashed line. 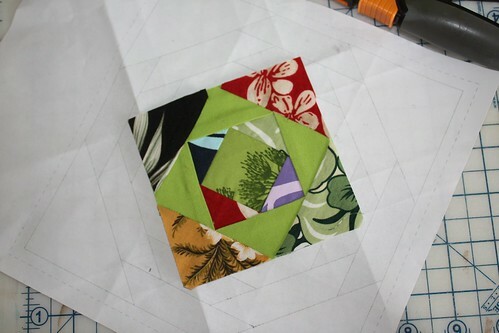 Press your finished block so all the fabrics lie flat and then trim the block square along the dashed lines. Make more blocks, using a new paper foundation for each one. The goal is 63 blocks total. Next Monday(ish) we’ll see how everyone in class did with their “homework” and answer any specific questions that may have arisen. hmmmm…….. the “never made an even close to traditional quilt” quilter in me is slightly tempted…… perhaps?